I got out very early this morning to catch bait and picked the guys up at High Point at first light. The moon was very bright last night which made bait collection tough and fishing today even tougher. 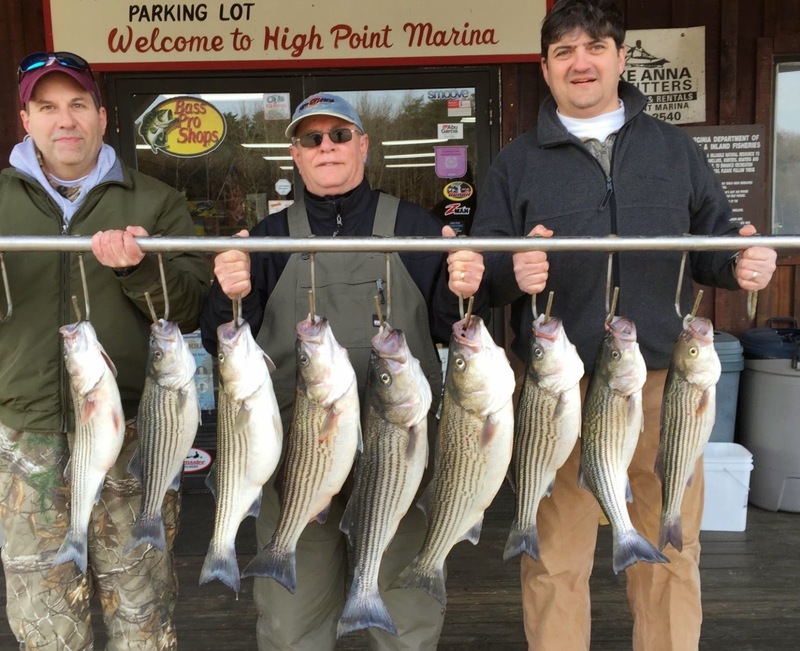 We fished hard today and ended up with these nine keeper Stripers. We also caught a few punks and Largemouth. I am hoping the weather will warm a little and stabilize somewhat. All these fronts are messing the Stripers up and making them difficult to pattern. The weather is calling for 65* tomorrow and 16* on Friday???? Go Figure!!! Today we caught fish in 50 foot of water and in 8 feet of water. I am getting really close to patterning these Stripers, I got it narrowed down to 42 feet???? The lake was frozen from Dillard's all the way up at 3 pm today.